Water in your home's crawl space is more than just an annoyance. Standing water or even just ever-present moisture in the air can create mold problems that lead to chronic health issues for your family. At the extreme end, water in a crawlspace can lead to rot and decay that weaken structural members and make major architectural repairs necessary. The presence of moisture can also foster termites, carpenter ants, and other pests that can damage your home and affect your quality of life. Before you can effectively remediate water problems in a crawl space, you must first identify the source of the water. Water problems in a crawl space can come in many forms, ranging from simply ground vapor that can cause mold and mildew, to deep pools of standing water that can cause devastating rot to beams and posts. Identifying the source of water issues requires that you inspect things from inside the crawl space several times, preferably in different conditions—during dry weather and wet weather, in summer and in winter. Locate the access opening to your crawl space. This is sometimes an outside hatchway in the exterior wall around the crawlspace; in other instances, it may be a hatch in the floor, often located in a closet or utility area. Equipped with a good flashlight, sturdy work clothes, and plastic sheeting to protect your clothes as you crawl about, enter the crawl space and inspect every area—both the ground and the structural members of the house above you. Look for signs of standing, puddling water on the ground, and signs of the discoloration caused by mildew and wood rot on the wooden posts, piers, and overhead structural members of the house. Where you find standing water on the ground, it is important to identify whether the source of the water is groundwater—water flowing in or seeping up from the ground—or if it is coming from above grade, usually a leak in plumbing fixtures, drain pipes or water supply pipes running in the space below the floor of the house. Below-grade water problems typically become exaggerated during certain seasons of the year, especially rainy months. If your periodic inspections show that puddling water occurs more during these periods, then it is likely you are dealing with water entering the crawlspace from below grade—either as run-off from rain or from a rising water table. In many parts of the country, the water table is quite high, and the rainy season can cause water to rise up into standing puddles in low areas of the crawlspace. If the puddling water does not seem to be affected by seasons or weather, it is possible you are dealing with above-grade sources. This is most likely caused by plumbing problems in drain pipes or water supply pipes running beneath the floor in the crawl space. If you notice that the pooling, puddling water is found directly below a tub, shower, toilet or other plumbing fixtures, or beneath drain pipes, you are probably dealing with a plumbing-related water problem. The good news here is that plumbing problems can be corrected by a plumber, which will be less costly than dealing with groundwater issues. Simply humidity issues arise from water vapor transferring up from the ground into the crawl space. In this instance, you will rarely see puddling or pooling water, but there may be widespread evidence of mildew or mold on the wooden framing of the house. This can be a severe problem in crawlspaces without vapor barriers and without adequate ventilation. But the solution is often simply to lay a vapor barrier over the ground, which is a much less expensive fix than dealing with major groundwater problems. Depending on the severity of the problem, you may be able to correct water problems in a crawlspace yourself, or you may need to call in a professional water mitigation company. In areas where water problems are common, you will likely have several local companies that specialize in water mitigation services. Do not confuse them with basement drying and restoration companies, which come in after water problems have been fixed. Restoration companies clean and dry out the areas, but they do not fix the problem. Search for companies that advertise for basement or crawl space waterproofing and drainage repairs. Some general contractors also can do this work for you. Unless the crawl space can be accessed from the exterior, workers will need to bring in materials through the house and down an access door. All walk areas are protected with plastic or kraft contractor's paper. If your crawl space already has a plastic vapor barrier, it will be removed, rolled up, and removed through the access door. A trench is dug around the entire interior foundation, using the foundation as a guide. The trench is typically between 8 inches and 24 inches from the foundation. If the trench is any closer to the foundation, it can undermine the foundation and the home itself. A flexible perforated drain pipe about 3 inches in diameter is laid down along the perimeter of the entire trench. The drain pipe is now covered with drain rock filling in the trench. Any remaining soil from digging the trench is now spread evenly around the crawl space. The company typically subcontracts an electrician to install a ground-fault protected outlet in the crawl space. At the low end of the perimeter trench, the company will install a sump pump which will automatically activate whenever water collects in the trench. A discharge pipe will be routed from the sump pump to some appropriate discharge location outside the crawl space. A new 6 mil vapor barrier is laid over the ground of the crawl space to prevent vapor transfer from the ground. Where cross ventilation in the crawl space is inadequate, new vents are installed in the exterior wall of the crawl space. Very large spaces may be equipped with electric ventilation fans to facilitate cross ventilation within the space. Power: A GFCI outlet must be installed in the crawl space for the sump pump. It must already be in place or you must contract out an electrician to install it. A DIYer with good electrical skills may be able to do the work themselves. Low ceiling: A crawl space that is between 4 feet and 5 feet high is considered tall. Even such a tall crawl space is very difficult to move around in. 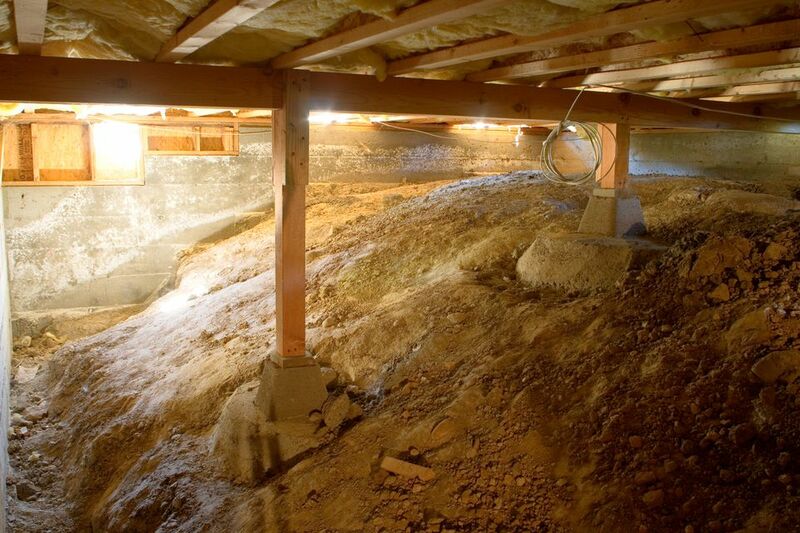 Many crawl spaces offer only 2 to 3 feet of vertical space. Heavy materials: Hundreds of pounds of bagged drain rock must be carried into the crawl space, along with hundreds of feet of perforated pipe. Limited access: There may be only one small door that allows access to the crawl space, and this door may be located in some inconvenient place, such as a bedroom closet or kitchen pantry. Water can sit in the crawl space for months or even years without having any overt adverse effect on your house. This may give you the false impression that everything will be fine for the length of your ownership of the house. However, over the long term you are in for trouble: Standing water can damage the house's foundation; wooden beams and joists will begin to rot; various strains of mold can develop. Even if you don't mind standing water in your crawl space, you will be required to fix the problem when it comes time to sell the house. A future buyer will be unable to obtain a loan to buy a house with water problems in the crawl space. Once you discover water problems in your crawl space, it is best to deal with it as soon as you can. Yes, water problems are expensive to mitigate, but the results of ignoring them are very serious and even more expensive.